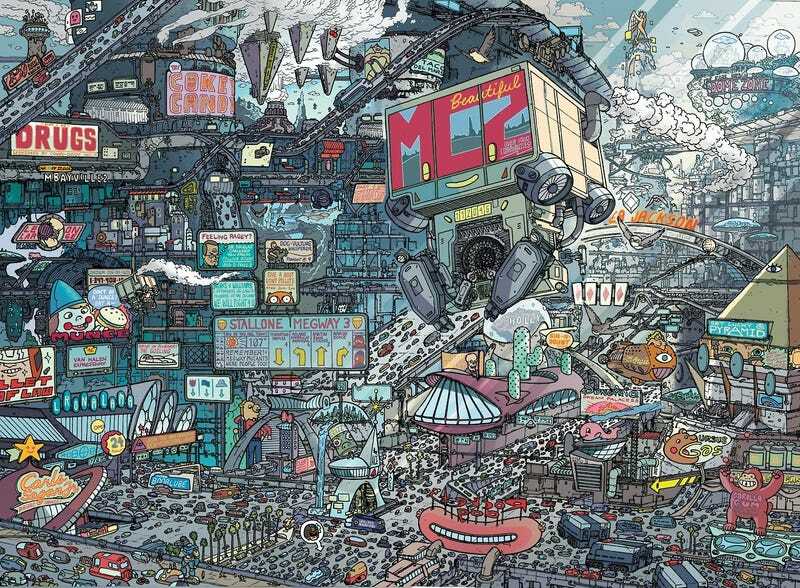 Like Chris Burden's Metropolis II sculpture crossed with the Futurama opening credits, Mega-City Two is a deliciously detailed cacophony of vehicles, fast food, and sprawl. Because it's, you know, L.A., there will inevitably be comparisons to Blade Runner. But the Los Angeles in Mega-City Two is an entirely different animal, based on the ideas of another fictional city first created in the Judge Dredd universe 36 years ago: The New York-esque Mega-City One. Those who aren't comic fans are probably familiar with one of two Judge Dredd movies, says Mega-City Two's Portland-based writer Douglas Wolk. "A pretty terrible one with Sylvester Stallone in the mid-'90s, and a fantastic one with Karl Urban, Lena Headey, and Olivia Thirlby last year." Wolk was 12 when he first discovered Dredd, which has been appearing weekly since 1977 in a British comic book called 2000 A.D. He recently started a blog to write about some of the early episodes and was contacted by San Diego comics publisher IDW, who was launching a new American Judge Dredd series. Soon Wolk was teamed up with illustrator Ulises Farinas and colorist Ryan Hill to create a miniseries within the Dredd franchise, the first to take place in Mega-City Two. Most of the Judge Dredd stories take place in Mega-City One, a 22nd-century megalopolis that has consumed most of the Eastern Seaboard—a kind of post-apocalyptic Gotham Gone Wild. Mega-City Two was first mentioned in a 1978 story as Mega-City One's West Coast sister megalopolis, a "5,000 square-mile" California city, that, in 2114, is nuked to a cinder. "It was being overrun by zombies; they had to destroy it in order to save it," says Wolk. Luckily Wolk's Mega-City Two is set in 2094, twenty years before annihilation. What attracted Wolk to the project was the incredible collaborative world-building that had taken place thanks to the many artists and writers over the years. In Matt Brooker's brief history of the Judge Dredd franchise, Brooker argues that Mega-City One became much more of a character than anyone had expected: "Really, the city is the actual star of Judge Dredd." To build Mega-City Two, Wolk started by examining the urban planning of Mega-City One. "It's basically wall-to-wall skyscrapers all along the Boston-to-Washington corridors," he says, "'cityblocks' with tens of thousands of people living in each one where you can spend your whole life without leaving." He then applied those same rules to Mega-City Two, essentially extrapolating the current look of L.A. "Massive gigantic metastasizing cloverleaves of highways everywhere. Gorgeous Googier-than-Googie architecture, and a radically different look for every neighborhood," he explains. Wolk and Farinas also collaborated on the cultural references, which are absolutely priceless. There's the Stallone Megway 3, freeway named for the star of the Dredd movie, of course. A billboard for the "Scientipicopalians." A Carl's Sagan, Jr. burger joint. I especially liked the "O'Shea Jackson Hyper Cube Zone," named for O'Shea Jackson, the person you'll know better as Ice Cube, who studied architectural drafting in college. Of course, one of the most important issues to figure out for Wolk and Farinas was how the L.A traffic of the future would be represented. Spoiler alert: It's worse. The landscape is ruled by "traffic knots" and "traffic spheres," which have multiple tiers of express lanes to which access is available for increasingly astronomical fees. (Again, not that far from today's reality.) Notably, "Road Drones"—massive flying construction vehicles—are employed to fabricate or rearrange roads as needed. Traffic management on the fly! To build Mega-City Two's culture, Wolk looked to the literary world for inspiration, reading (or re-reading) books by Joan Didion, Hunter S. Thompson, and Bruce Wagner. The series itself is subtitled "City of Courts," a riff on the 1990 Mike Davis book City of Quartz that examined the fate of Los Angeles through the lens of law enforcement. Wolk used Davis' ideas to create Mega-City Two's political structure. "One of the things that Davis suggests is that L.A. is a whole bunch of economically stratified communities smushed up against each other," says Wolk. "So I figured: what if they were in fact so deeply culturally stratified that every one had its own set of laws—but the same police had to enforce them everywhere?" Any depiction of L.A.'s future law enforcement will, of course, be compared to the L.A. of Blade Runner, which is set in a basically present-day 2019. But Wolk says that he specifically resisted its dystopian nature—and its darkness. "In Blade Runner, L.A. is a night city," he says. "We'll see a little of the nighttime side of things later on but, right off, I wanted to establish it as a really bright, sunny place—somewhere people might want to live."